JEAN – Oxfordshire Ironstone Co., Wroxton Oxfordshire, then Stewarts & Lloyds (Minerals) Ltd, Glendon East Quarries, Storefield & Corby Quarries, Northants. Jean was delivered ex-works on 21st January 1965 as the last of the 30 ton “girls” ordered by the Oxfordshire Ironstone Company to replace their steam locomotive fleet, S10204 taking the name of a modern 0-4-0 Hudswell Clarke steam locomotive of only 11 years old. The loco was used as a test bed for the following OIC mainline Sentinel locos by having a higher ratio gearbox and the provision of vacuum braking equipment including holes in the buffer beams, a train pipe, desk controls and exhauster fittings, all later taken up in the construction of the “boys”. JEAN was the last loco to leave Wroxton and was transferred on 16th May 1968 to Glendon East Quarries, then on 21st January 1969 to nearby Storefield Quarries until they too closed and the loco, now numbered 8311/03 in the S&L (Minerals) Ltd plant number series, was taken into the large Corby Minerals fleet on 25th June 1973. It was subsequently sold via Thomas Hill to Midland Yorkshire Tar Distillers Ltd of Kilnhurst in 1975. After a long period away from the ore fields of the east midlands, JEAN returned in summer 2011 to reunite with Sentinels, sister BETTY and brother GRAHAM for the first time since the fleet was parted in 1967. 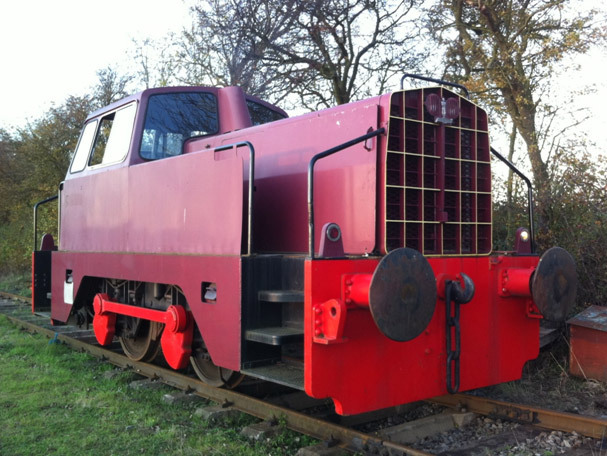 JEAN is in full working order and the original vacuum braking system is currently being reinstalled to allow the loco to take charge of passenger trains for the first time in its history.